So I had this great idea for fall: I will finish all projects that are on the needles. Period. No ifs ands or buts. The problem I have discovered is that I have a slightly obscene number of needles. Needles of all shapes and sizes too: circulars (mostly), double points, and straights. I even found some needle duplicates which was a little annoying. I long ago found organizational solutions for my needles so that’s all well and good and I even downloaded an i-phone app to avoid purchasing duplicate needles in the future. What got me thinking was the sheer number of types of knitting needles and the variety of materials they are made of. This had me wondering how do people know what needles are best for them and their project? It often comes down to personal preferance or budget as far as materials go, but I have a few needle thoughts that might help those who are trying to decide which needles are the ones for them. There are so many, I think I will start with my personal fave: circulars. Circulars: Some people use circulars and circulars only. You might be wondering how they can make something like a sock on circulars but there is in fact 2 different ways of doing that. 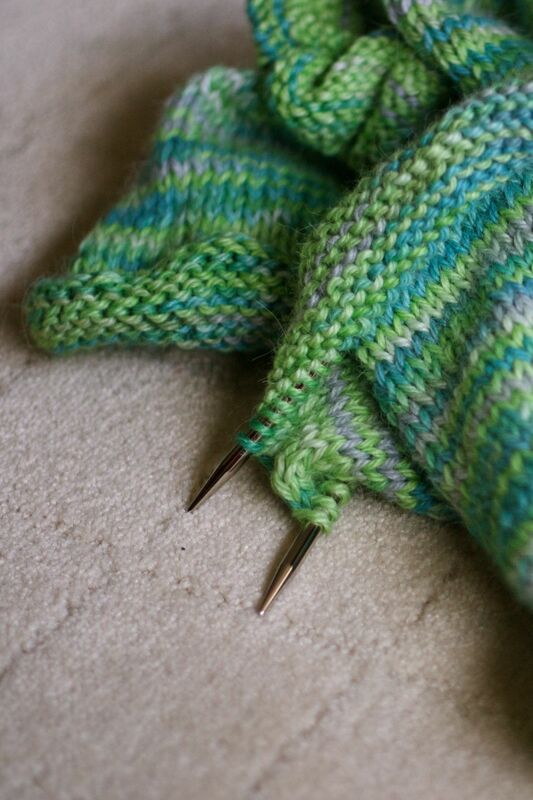 You can use the Magic Loop method and make a sock on one needle, or you can use 2 circulars. This goes for sleeves or hats or anything with a small circumference. What are the benfits of the circular needle? The weight distribution is a big one for me. I like that the bulk of your knitting is in the middle of the cord, as opposed to straight needles which have you moving the weight from side to side. It’s not really a big deal for smaller items, like hats, but for a sweater this can be a major issue. Carrying a lot of sweater weight from side to side can not only impede your knitting, but it can give you tension issues as well. The other benefits include the large number of stitches you can carry (an entire blanket’s worth if necessary), and the avoidance of double points. If you are like the many people who either hate using or are a little scared of double points (I am, for the record, not one of these individuals, I love dpn’s), circulars are a lovely solution. You don’t get ladders like you might with dpn’s either, another plus. The down side? There are what seem like a million permutations of needle size and cord size. I personally own about 4 pairs of 4.5mm circulars in various lengths. If you are an Addi Turbo addict like myself this can start to add up and cut into your yarn budget! It can also get annoying if you decide that you will use your 47″ 4.5mm circular to make something that is really only 24 inches across. You end up with a rather obnoxious amount of cord in your way at all times. The solution to this is really a click or interchangeable set of circulars. It’s a larger one time expense but I think it’s really the way to go. You get almost every needle you will need in one shot and you always have the right size cord and needle for the job. We have a plastic interchangeable set in the Denise kits and we’ve got the Addi Turbo Set and the Hiya Hiya set. We are still awaiting the Addi Lace interchangeable set (some, like me, are waiting with baited breath). Come on down and we would be happy to walk you through which set is the one for you! This entry was posted on Thursday, September 9th, 2010 at 6:30 pm	and is filed under Uncategorized. You can follow any responses to this entry through the RSS 2.0 feed. Both comments and pings are currently closed.